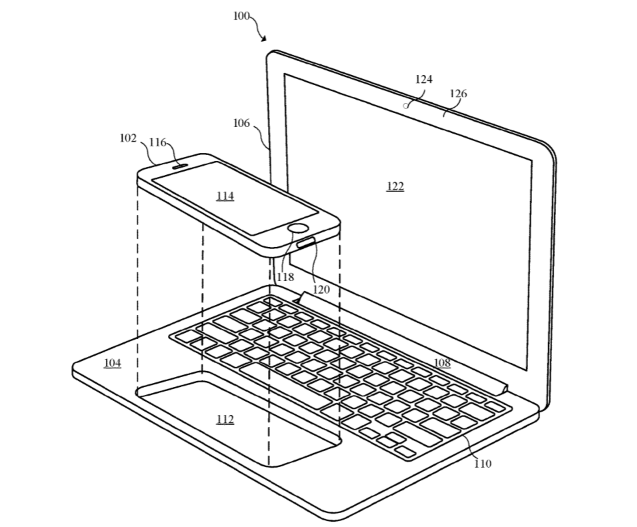 A patent created by Apple, and unearthed by Apple Insider, shows that the Cupertino giant is playing around with the idea of creating laptop-style docking stations, that can hold an iPhone or iPad. The first shows an iPhone that docks into a laptop, taking the place of a trackpad. In this example, the laptop acts as a dumb terminal, with all the computational leg-work taking place in the iPhone. The other is less outlandish, and shows an iPad acting as the screen on a MacBook. Given that there are already keyboard cases for the iPad that closely adhere to the laptop form factor, like the BrydgeAir, this one didn’t particularly phase me all that much. It’s worth emphasizing that the existence of a patent doesn’t always mean that the company is looking at it seriously. Even still, it’s worth putting on your skeptical hat. Firstly, the phone-that-turns-into-a-laptop schtick has been tried before, with limited success. The first notable company to take a stab at this particular product market was Motorola, with the Atrix 4G. This was most recently followed by HP, with the Elite X3 Lapdock. Neither shifted many units, on the account of being too niche, and too expensive. Then there’s the fact that the way people consume phones, and the way people consume laptops (particularly Apple laptops) are fundamentally different. People tend to update their phones on a regular basis, with new upgrades acquired every year or two. While laptops have a much longer lifespan. Anecdotally, I know people who are still content with their 2009 MacBook Pros, and even in 2017, they see no reason to upgrade. Most laptop buyers just aren’t up for being trapped in a two-year replacement cycle. And believe me, that’s what would happen if Apple morphed the iPhone with a MacBook. Read next: Why is Apple afraid of forcing users to reset their passwords?